Shuttering coal and oil fired power plants lowered the rate of preterm births in neighboring communities while also improving fertility, according to two new University of California at Berkeley (UCB) studies. Researchers compared preterm births and fertility before and after eight power plants in California closed between 2001 and 2011, including San Francisco's Hunters Point plant in 2006. Overall, the percentage of preterm births - babies born before 37 weeks gestation - dropped from 7 percent the year before plant closure to 5.1 percent in the year after shutdown. Non-Hispanic African-American and Asian women dropped even more: 14.4 percent to 11.3 percent. Preterm births, which can often result in babies spending time in a neonatal intensive care unit, contributes to infant mortality and can cause health problems later in life. The World Health Organization estimates that the cost of preterm births, defined as births between 32 and 37 weeks of gestation, accounts for some $2 billion in healthcare costs worldwide. The percent of drop in preterm birthrates following plant closures is larger than expected, but consistent with other studies linking birth problems to air pollution around power plants, said UC Berkeley postdoctoral fellow Joan Casey, the lead author of a study published May 22 in the American Journal of Epidemiology. A second paper published May 2 in the journal Environmental Health used similar data and found that fertility - the number of live births per 1,000 women - increased around coal and oil power plants after closure. Casey: "Most people look at air pollution and adverse health outcomes, but this is the flip side: We said, let's look at what happens when we have this external shock that removes air pollution from a community and see if we can see any improvements in health." Casey hopes the findings help policy makers in California and other states as they strategically plan for decommissioning power plants as they build renewable sources of energy — in order to make the biggest health impact. In a commentary accompanying the AJE article, Pauline Mendola of the Eunice Kennedy Shriver National Institute of Child Health and Human Development added: "Casey and colleagues have shown us that retiring older coal and oil power plants can result in a significant reduction in preterm birth and that these benefits also have the potential to lower what has been one of our most intractable health disparities. Perhaps it's time for the health of our children to be the impetus behind reducing the common sources of ambient air pollution. Their lives depend on it." 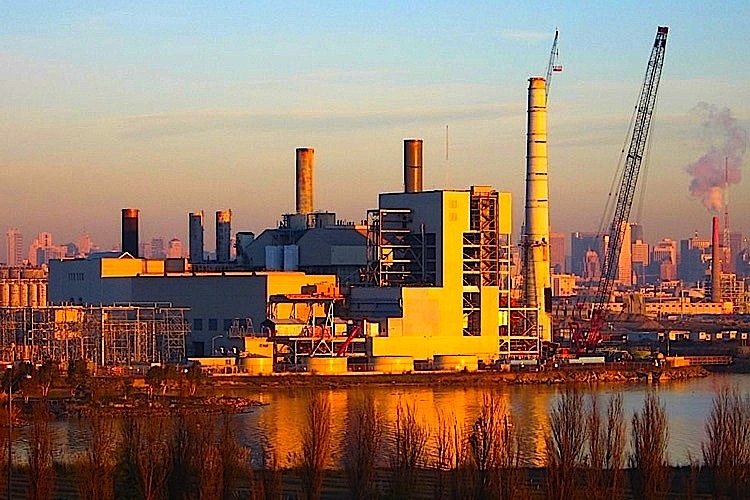 Researchers compared preterm birth rates in the first year following closure date of each power plant with the rate during the year beginning two years before plant closure, in order to eliminate seasonal effects on preterm births. They also corrected for the mother's age, socioeconomic status, education level and race and/or ethnicity. • Dividing the surrounding region into three concentric rings 5 kilometers (3 miles) wide, Casey searched state birth records to determine the rate of preterm births in each ring. • Those living in the closest ring, zero to 5 kilometers from the plant, saw the largest improvement with a drop from 7 to 5.1 percent. Those living in the 5-10 kilometer zone showed less improvement. Those living in the 10-20 km zone were the control population. • Downwind areas exhibited greater preterm birth rate improvements, however, the differences were not statistically significant. • As a control, the analysis was replicated around eight power plants that had not closed and found no before-versus-after difference, thus supporting the main analyses. There did not appear to be any measurable effects on births before 32 weeks, which may reflect that those very early births were a result of genetic or environmental problems more significant than power plant air pollution. Casey also noted that the study did not break out the effects of individual particulate matter such as sulfur dioxide, nitrogen oxides, benzene, lead, mercury and other known health hazards, but assessed the combined effect of a mixture of pollutants. "It would be good to look at this relationship in other states and see if we can apply a similar rationale to retirement of power plants in other places," surmised Casey. "We believe that these papers have important implications for understanding the potential short-term community health benefits of climate and energy policy shifts and provide some very good news on that front. These studies indicate short-term beneficial impacts on preterm birth rates overall and particularly for women of color." Rachel Morello-Frosch PhD, Professor, Environmental Science and Public Health, University of California at Berkeley, USA, and co-author. Abstract "Coal and oil power plant retirements in California associated with reduced preterm birth among populations nearby"
Coal and oil power plant retirements reduce air pollution nearby, but few studies have leveraged these natural experiments for public health research. We used California Department of Public Health birth records and Energy Information Administration data from 2001-2011 to evaluate the relationship between 8 coal and oil power plant retirements and nearby preterm births ( < 37 weeks gestational age). We conducted a difference-in-differences analysis using adjusted linear mixed models that included 57,005 births–6.5% of which were preterm–to compare the probability of preterm birth before and after power plant retirement among mothers residing within 0-5 km and 5-10 km of the 8 power plants. We found that power plant retirements were associated with a decrease in the proportion of preterm birth within 5 km (-0.019, 95% CI: -0.031, -0.008) and 5-10 km (-0.015, 95% CI: -0.024, -0.007) controlling for secular trends with mothers living 10-20 km away. For the 0-5 km area, this corresponds to a reduction in preterm birth from 7.0% to 5.1%. Subgroup analyses indicated a potentially larger association among non-Hispanic Black and Asian mothers compared to non-Hispanic White and Hispanic mothers and no differences in educational attainment. Future coal and oil power plant retirements may reduce preterm birth among nearby populations. This research was supported by the UC San Francisco California Preterm Birth Initiative, which is funded by Marc and Lynne Benioff. Additional support was provided by grants from the National Institute of Environmental Health Sciences (K99ES027023, P01ES022841, R01ES027051) and the U.S. Environmental Protection Agency (RD-83543301). Abstract "Increase in fertility following coal and oil power plant retirements in California"
Background: Few studies have explored the relationship between air pollution and fertility. We used a natural experiment in California when coal and oil power plants retired to estimate associations with nearby fertility rates. Methods: We used a difference-in-differences negative binomial model on the incident rate ratio scale to analyze the change in annual fertility rates among California mothers living within 0-5 km and 5-10 km of 8 retired power plants between 2001 and 2011. The difference-in-differences method isolates the portion of the pre- versus post-retirement contrast in the 0-5 km and 5-10 km bins, respectively, that is due to retirement rather than secular trends. We controlled for secular trends with mothers living 10-20 km away. Adjusted models included fixed effects for power plant, proportion Hispanic, Black, high school educated, and aged > 30 years mothers, and neighborhood poverty and educational attainment. Results: Analyses included 58,909 live births. In adjusted models, we estimated that after power plant retirement annual fertility rates per 1000 women aged 15–44 years increased by 8 births within 5 km and 2 births within 5-10 km of power plants, corresponding to incident rate ratios of 1.2 (95% CI: 1.1–1.4) and 1.1 (95% CI: 1.0–1.2), respectively. We implemented a negative exposure control by randomly selecting power plants that did not retire and repeating our analysis with those locations using the retirement dates from original 8 power plants. There was no association, suggesting that statewide temporal trends may not account for results. Conclusions: Fertility rates among nearby populations appeared to increase after coal and oil power plant retirements. Our study design limited the possibility that our findings resulted from temporal trends or changes in population composition. These results require confirmation in other populations, given known methodological limitations of ecologic study designs. Authors: Joan A. Casey, Alison Gemmill, Deborah Karasek, Elizabeth L. Ogburn, Dana E. Goin and Rachel Morello-Frosch. We thank Elena Krieger and Kristina Dang for their assistance in assembling environmental data and Ralph Catalano for his advice regarding the analysis. Funding: This work was supported in part by the University of California, San Francisco Preterm Birth Initiative. Additional support was provided by the National Institute of Environmental Health Sciences through grant K99ES027023 (Dr. Casey) and grants P01ES022841 and R01ES027051 (Dr. Morello-Frosch), and the grant U.S. EPA RD-83543301 (Dr. Morello-Frosch). This publication was made possible in part by support from the Berkeley Research Impact Initiative (BRII) sponsored by the UC Berkeley Library. The Hunters Point power plant before it was retired in 2006 and later demolished.